The verdict was notified of Cao Haibo’s lawyer Ma Xiaopeng (马小鹏) Thursday morning, Beijing time, via a phone call. 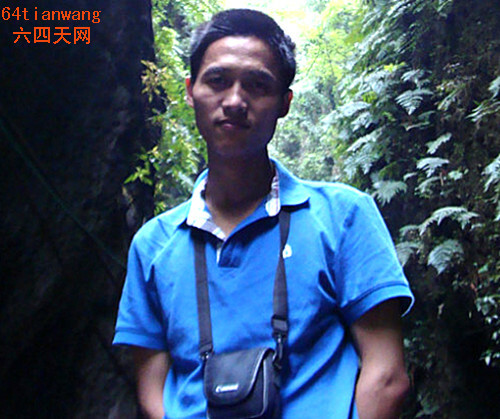 The lawyer told 64tianwang.com, a Chengdu-based rights advocacy website, that it is outrageous that the Kunming Intermediary Court made the decision without the knowledge of either the lawyer or the family and that their procedures a violation of China’s own law. Cao Haibo and his wife, a young couple in their 20s, moved to Kunming to seek opportunities last fall. Also last fall, Cao founded an online QQ chat group called 振华会 (League of rejuvenating the Chinese nation – his own translation) to discuss ideas of constitutional democracy. More specifically, Cao Haibo advocated to give new meanings to Dr. Sun Yat-sen’s Three Principles of the People based on the current circumstances: the Principles of Nationalism, the Principles of Democracy and the Principles of People’s Livelihood. The website of Cao’s virtual group, which he announced on his Tencent Weibo account, has since been severed. After announcing Cao’s arrest, according to 64tianwang.com, a senior state security officer in Kunming spoke to Cao’s 23-year-old wife Zhang Nian (张念), who was then six-month pregnant, pressuring her not to talk about Cao’s case, and promising her that the more she kept it to herself, the more likely Cao would receive lenity. On May 22, Cao Haibo was tried in the Kunming Intermediary Court. The court denied all applications for court observation, including that of his wife, with prosecutors’ claim that the case involved state secrets. After the trial, Zhang Nian and her new-born baby was allowed a brief meeting with Cao Haibo, for the first time since his detention. Cao Haibo’s wife Zhang Nian and their 3-month-old baby outside the court building in May, 2012. Cao Haibo’s sentence came a week before the CCP’s 18th National Congress and the once-in-a-decade leadership transition, amid rumors and speculations about hopeful prospects of political reform. Upon hearing the news of Cao Haibo’s sentence, media professional Wen Yunchao (温云超) with iSunAffairs Weekly in Hong Kong, tweeted that “The Cao Haibo verdict, delivered at this particular juncture, cannot possibly be a decision made by the local court. Instead, it can be seen as a signal, a gesture, from the top.” Wen Yunchao hopes Cao’s case, and the severe nature of his sentence, will receive media attention from journalist colleagues. By T in Human Rights & Civil Rights, Rule of Law on November 1, 2012 . This only shows how paranoid they’re. Democracy in my country can be really ugly and hypocritical, and I have grew cynical about it, but at least nobody puts me into jail for opening my mouth. I hope someday you will publish these true stories in a book. We that watch China are aware of the extraordinary number of stories like this one but most in the west are either unaware or forget as these piece meal events occur. An anthology would be a powerful argument against those who would seek to pawn this off as a set of isolated incidents blown out of proportion by foreigners trying to keep China down. Hua Qiao, as a self-motivated “kitchen activist” (doing my work on our dining table most of the time), what I have written here is a tiny tip of what’s happening in China to those who dare to counter, politically or economically. In western media as well as in the human rights circles, people talk about the “deterioration” of rule of law in China, as though it was better before, whereas there has never been a time when China, under CCP, has had any degree of rule of law. And for the Party, the very notion of law being above the Party and neutral is ridiculous. Now that the stakes are higher and higher for the rest of the world, the less we kid ourselves about this, the sooner we see China as it is, the better.